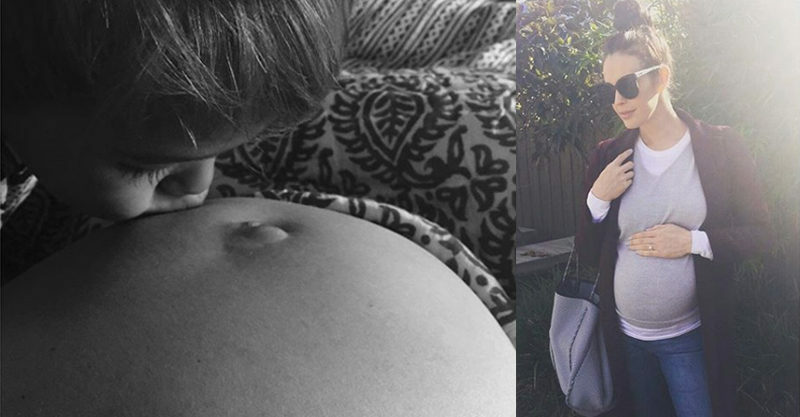 Pregnancy certainly gets a whole lot tougher when you’re near the end – just ask Megan Gale! Her funny Flashback Friday Instagram post today has perfectly captured what all awkward preggie ladies are feeling and thinking when the nine months is almost up. “When your #fbf is your mood…” posted the 42-year-old model on her Instagram page this morning, alongside a snap of herself in character as tough chick Valkyrie in the 2015 Aussie hit flick Mad Max: Fury Road. The photo was of a scene featuring Megan’s character holding a shot gun poised to kill. “I’m pregnant, sleep deprived and decaffeinated. Don’t mess with me!” the model mum hilariously captioned the post. Megan is currently pregnant with her second child with partner, AFL player Shaun Hampson. The pair already have a three-year-old son called River. Recently she opened up about the difficult journey it’s been to have another child, revealing she sadly suffered a miscarriage in April 2016 and also struggled for six months to conceive again. Luckily for the loved-up parents she did! They announced her pregnancy earlier this year with a cute little snap of an actual bun sitting in an oven. It’s unknown exactly when Megan’s due date is, but given her recent bump shots and her current fed up pregnant lady mood, we’re sure there’s not long to go now. Hang in there Megan and all those other heavily pregnant mums-to-be! You’re doing a fab job!